Judith Schalansky’s first book to appear in English was Atlas of Remote Islands: Fifty Islands I Have Not Visited and Never Will, its meticulous design, maps included, indicating her ownership of the book as an object (she has also published a compendium of font, Fraktur Mon Amour). 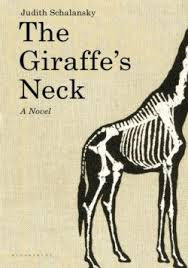 Her latest novel, The Giraffe’s Neck, though more conventional in construction, also comes interspersed with illustrations. Though a designer rather than an artist, Schalansky reminds me of Alasdair Gray who similarly crafts the design and illustration of his work; indeed, Poor Things (a novel in which medicine is prominent) is full of anatomical illustrations (from Gray’s Anatomy, of course) just as The Giraffe’s Neck is littered with pictures one might expect to find in a Biology text book. The novel progresses Jean Brodie like towards her downfall, and, as with Brodie, it is not for the reasons we expect, but Schalansky neatly ties in the moment when her relationship with Claudia was sundered irrevocably with the moment her career as a Biology teacher ends. As one might expect, is a beautifully crafted novel. I enjoyed the way our view of Lohmark changes: one moment we are laughing with her, the next shocked and angered, and (again like Brodie) at times almost sympathetic. The bravado with which Schalansky uses biology to both create Lohmark’s character and explore her themes, though it may prove a little too narrow for some readers, suggests a confident writer who is worth watching. You are currently browsing the archives for the Judith Schalansky category.